Hello XMR users! Welcome to our second Monero Missives. Usage: This affects simplewallet, and is the default behaviour for --generate-new-wallet. If you would like to disable the deterministic seed during wallet generation, you can pass the --non-deterministic flag. 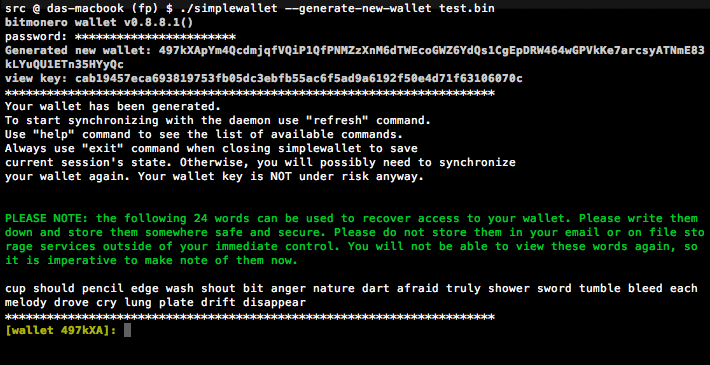 To restore from a seed you can use the --restore-deterministic-wallet flag. This provides a MAJOR benefit in that backing up your wallet no longer requires backing up the .bin.keys file! All you have to do is write down the 24 words and that's the only backup you need. If you're particularly brave you can even memorise the 24 words. You can also use this to create an offline cold wallet or a paper wallet: create a wallet on a computer disconnected from the Internet, write the 24 words and the address and the view key down, and then remove all the files created by the wallet. Security notes: Please note that this key is independent of your password. By default the 24 word key is written to simplewallet.log when the wallet is created. This is the expected behaviour, the next release will both exclude this from the log and reduce the default log level. Please run --generate-new-wallet with the --set_log 0 flag, or alternatively make sure to delete the simplewallet.log file afterwards. Technical details: The key length for this remains 256-bits and thus does not compromise user security. The view key seed is generated from a keccak1600 hash of the spend key (which is directly from the mnemonic seed), hence the deterministic nature of this. The non-deterministic method is still available as an option. How to get it: binaries in the OP have already been updated, or you can compile from the source on github. Moving to a deterministic wallet: unfortunately it's not possible to retroactively make an existing wallet deterministic. If you want to take advantage of the new feature, you will have to create a new wallet and move your funds in there. 2. XMR is now on Mintpal for voting. You can find the voting link here: https://www.mintpal.com/voting#XMR - Mintpal allows 1 vote an hour from registered users who have traded before, as well as paid-for votes. 3. Monero will be officially represented by fluffypony at the Bitcoin Supernode Conference at Malla Castle in Estonia at the end of this month. 4. Neozaru has made great strides in his RPC-based Qt GUI wallet, and it requires some testing. If you are keen on trying it out, head over to his comment the GUI thread, give it a spin, and give him feedback. RPC: incoming_transfers is now available as a simplewallet RPC API call, and payment_id has been added as an optional argument to the transfer RPC API call. Neozaru also committed a large amount of additional functionality to the RPC API, including progress estimation to getinfo. I2P: no commits this week, much of the work has been around scoping and planning the RPC subsystem. Core: new seed nodes have been added, so bootstrapping on cold start should work just fine. We are going to add DNS seed node bootstrapping at a later stage. Docs: work has begun on adding Doxygen comments throughout the code. This will both help us to understand the code written by "The CryptoNote Developers" (who appear at the top of every piece of source code except for the epee library), but will also result in proper developer documentation being made available. Mining: Wolf` has continued to improve his CPU miner - the latest copy of which can be found on his github repo. Mining: Claymore released a CryptoNight GPU miner, which you can find at this thread. Please be advised that his miner is currently closed source, and the appropriate level of caution should be exercised. PS. If you've made it this far, there's a reward in the example wallet listed in the screenshot - first to grab it gets the prize! Thank you for keeping us updated. We'd appreciate if you could continue doing so. Catherine_Erwin wrote: Thank you for keeping us updated. We'd appreciate if you could continue doing so. Great, would you prefer I send these updates to there or continue posting here? Hello, and welcome to our third Monero Missive. 1. We've been stalling this week's Missive on purpose, because we were hoping it would happen...and it happened! We got to number 1 on the MintPal voting list in a week - which is quite an achievement. There was quite a stack of paid-for votes (more than normal for a cryptocurrency on the MintPal voting list), which is surprising, but it definitely helped catapult us up front. 2. We are immensely grateful for the work the CryptoNote developers have put into the protocol, but their whitepaper is unfortunately lacking in peer reviews. To that end, we have taken it upon ourselves to peer review the whitepaper, and to release the peer review as an annotated whitepaper. This feature requires more testing, and is NOT in the main code base yet. If you're able to build Monero, please grab it from fluffypony's repo here, and build and test: https://github.com/fluffypony/bitmonero - you won't need to build tests or change the daemon, it's just simplewallet's operation that has changed. Please do not try this with the RPC API yet, this needs the CLI at the moment. 4. We have had a lot of people asking about the progress of the GUI wallet. We'd like to reiterate that there are a great number of core and fundamental things that need to be worked on before we can get lots and lots of users flocking in. Some of the core necessities that we're working on at breakneck pace are: QoS to reduce the bandwidth demand on full nodes (as everyone will be running a full node at this stage anyway), segregation of wallet functions in order to create a far more robust system for exchanges and merchants to use, Gitian-based builds for everyone's safety and to ensure binaries are safe (safer, really), moving blockchain storage to an embedded database, fixing the now-infamous "ABSTRACT_SERVER_SEND_QUE_MAX_COUNT" (in big red letters!) error that is quite harmless but everyone freaks out about, and so on. These are issues at Monero's core that we're working on, and we need to have these in place and fixed before a GUI wallet is widely dispersed, otherwise there will be massive resource constraints placed on user's systems. We're not here to win a race against other cryptocurrencies. We're here to to continue to push out great features and stable and reliable code, in a way that will make sure Monero is around for decades and not just a flash-in-the-pan. Core: We've incorporated two changes from BBR - proper tx_pool handling, and a fix for the high number of orphans pool miners were experiencing. tx_pool handling is incomplete, as it is implemented by the daemon but the wallet is not, as yet, mempool aware. You can submit it both here and to the email. There can't be too much information on CryptoNote currencies. Hello, and welcome to our fourth Monero Missive! 2. Just in case you weren't aware, XMR has been added to two exchanges: BTer and MintPal! 3. Work continues on the annotated CryptoNote whitepaper, the latest version of which can be found here: http://monero.cc/downloads/whitepaper_annotated.pdf. We have also begun a parallel analysis of the implementation of the concepts in the Monero code (most especially as it has been inherited from the reference implementation). 4. We caught a bug where restoring a deterministic wallet would not find old transactions. This was due to the assumption that is made by simplewallet that a newly "created" wallet will never have old transactions in it. This has been patched, and will be merged up to master and included in updated binaries from the beginning of next week. 5. We've been putting a lot of emphasis on making Monero a lot more stable and usable by pools, merchant systems, and exchanges. More details on our ongoing efforts in the dev diary below! 6. Transaction auto-splitting has been testing quite well, and is just about ready to be included in the main codebase (subsequent to a few minor changes on the RPC side). Core: major overhaul to the daemon is in progress in mikezackles' repo (https://github.com/mikezackles/bitmonero/tree/daemonize). Currently this is Linux / OS X only, and allows for the daemon to fork to the background properly (whilst still allowing daemon commands to be executed against it). Windows support by means of a Windows service will come later. Core: along the same lines, simplewallet has been split out into simplewallet (CLI) and rpcwallet (stand-alone RPC daemon), ongoing work is on tewinget's branch (https://github.com/tewinget/bitmonero/tree/rpcwallet). Hello, and welcome to our fifth Monero Missive! 1. fluffypony had a great time discussing Monero at the Bitcoin Supernode Conference in Estonia. Many thanks to rpietila for hosting him and all attendees. 2. Work on the academic peer review of the CryptoNote whitepaper is slowly starting to move away from an academic platform and on to the code itself, to determine whether the reference implementation correctly implements the whitepaper. Before that happens, though, a summary of the initial findings will be published. We are expecting this to be completed this coming week. 3. Transaction auto-splitting is now in the main codebase. To explain our methodology: the main github repo will always be "active development", and may contain code that will be reverted or is not fully tested. For those that are brave and want to test and contribute to development, it is the ideal starting point. However, on an ongoing basis we are going to create tagged releases, whereby when a group of new features have been fully tested, a new release can be tagged, and binaries can be put out (along with the code on the github tag, of course). Expect this change to start taking effect within the next 4 weeks. 4. We'd like to apologise for not finalise the GUI bounty - everyone has been a little scattered this week. We will resolve this in its entirety within the next 48 hours! This Missive is a little light on major updates (well, we can't have something major every week;) primarily because there has been lots of plotting and planning this week. As always: you can keep up to date with the nitty-gritty on IRC in #monero-dev on Freenode if you're interested. Hello, and welcome to our sixth Monero Missive! 2. As you may be aware, there's been a great deal of discussion around dev donations. It wasn't something we thought to raise previously, as it is generally accepted that if you are making money from an open-source project (eg. mining, buying and holding for future profit, whatever) you will generally donate as that is the best way to secure an increase in your "investment". It is important to note that this is not a cryptocurrency that has a big, fat premine (or any sort of instamine / ninjamine / premine), and we are, therefore, completely reliant on the donations of our users. We really, truly appreciate all of the donations that we have received, from early pools such as the now-defunct monero.farm contributing a large portion of their earnings, to our largest donation from ceger, to the ramp-up in dev donations from a screed of pools. Thank you, you guys are the ones that are helping us cover costs and pay for contributors where necessary. 4. Very early work has begun on reimplementing the mnemonic wordlists in other languages. We are currently doing a German one as a tester to see the amount of effort involved. If you are interested in producing a mnemonic wordlist (1626 words, following a small set of rules) in a language other than German or English please drop us a pm. There will be other translation work coming up (website, tooling etc. ), and we will definitely be distributing donations to translators where possible (although they may be relatively small for the work involved). Core / Wallet: both the new daemonized daemon and rpcwallet are nearing a stage where they can be merged into master. The final step is to finalise the daemonizing code in rpcwallet, in such a way that it acts the same as the daemon, and we can move from there. I8N: mnemonic word list German version is in progress and about 90% complete. I2P: subsequent to discussions with the I2P team, we are going to be making a bit of a diagonal movement from libi2pcpp to i2pd. This should end up with us slightly ahead on the I2P integration project than we would've been. The major focus at the moment is getting TCP streaming (for persistent connections) to work, and that is where the largest focus is at present. Hello, and welcome to our seventh Monero Missive! 1. We've had an incredibly positive response to our ongoing need for donations, and we'd like to thank everyone that has donated and continues to donate. Several pools have stepped up to donate some of their fees to us - CryptonotepoolUK, for instance, has a 1% fee, but the entirety of the fee is donated. Risto Pietila has also kindly setup a donation "Hall of Fame", which has been taken over by cAPSLOCK, and can be found here. This, and all the ongoing donations, are critical to our ability to spend even more time and energy on Monero, and are greatly appreciated. 2. Now that the CryptoNote whitepaper has been peer reviewed by our mathematicians and cryptographers, they have begun initial work reviewing the implementation thereof. This is most especially important, as Monero has inherited quite a bit from the CryptoNote reference code. The initial focus is on the cryptographic primitives and higher-level cryptographic functions, which will be evaluated by code analysis as well as by running test vectors (that are different from those in the Monero test suite) against those functions. The methodologies and results will, of course, be published in due time. 3. A number of important and critical dev efforts are under way, most notably the embedded database work (to cut down on the RAM requirement), the daemonising work (to allow for a much more stable environment for exchanges, pools, merchants, and other automated systems), and the QoS work (to reduce and limit the bandwidth requirements). Technical updates on these are in the dev diary below. 4. We'd like to officially welcome Pavel Kravchenko as a key technical contributor to Monero. With a PhD in Information Security, specialising in public key infrastructures, he will be devoting some time to tackling the larger issues that Monero faces in its drive to become a truly private, untraceable cryptocurrency. 5. Further to the last missive, the German word list has been completed, and work has begun on the Portuguese version. This is very early work, and is very important to our ensuring that it fits well with our current mnemonic system. Core / Wallet: much of the work on daemonising Monero has been complete. On Unix-like systems (Linux, OS X) the daemon backgrounds correctly, and commands can be run against the daemon (through command line arguments or RPC calls). On Windows the daemon can install itself as a Windows service, and can subsequently be managed through the standard Windows service system. The Windows service can also be removed by the daemon. Similarly, rpcwallet has inherited this functionality, with the difference that rpcwallet can run in multiple instances (whereas the daemon only allows a single instance). This covers edge cases where a single machine needs to have multiple wallets accessible via multiple rpcwallet instances. RPC: a new get_connections RPC call has been added to the daemon and merged into master. This is needed by the DNS seed control software, which is at a very early stage. Once complete the hardcoded seed nodes will be removed in lieu of DNS seeds. At a later stage when the DNS seed control software is feature complete, there will be a call for 4 or 5 people who are happy to run DNS seeds on an extremely long-term basis. Hello, and welcome to our eighth Monero Missive! 1. We're extremely pleased to announce that Poloniex has, once again, proven their class-leading initiative by being the first major exchange to add Monero trading pairs. This has been coming for a while, given Monero's large trade volume on Poloniex, and we are certainly grateful to Poloniex for their forward-thinking approach. The markets that have been added are: BCN/XMR, DIEM/XMR, DRK/XMR, IFC/XMR, MAID/XMR, NXT/XMR, and QORA/XMR. The Poloniex press release can be found here. 2. A major change that has been made concerns the license Monero currently uses. We inherited the MIT / X11 license from CryptoNote, which is a very permissive license that explicitly allows re-licensing with compatible licenses. We have thus decided to move to the BSD 3-clause license, which is equally permissive, enforces attribution, and has a clause that prevents "the name of the copyright holder nor the names of its contributors" from being used to promote or endorse products. The epee library that is part of Monero was already under a BSD 3-clause license, so all we have done is just replaced it with the standard formatting we're using, and have included the original in the /contrib/epee/LICENSE.txt, noted as being the original license as it appeared. We have taken great care to preserve ALL copyrights for the original code, which are attributed to "the Cryptonote developers" for most of it, and "Andrey N. Sabelnikov" for epee. Our copyright appears above that so that we are the copyright holders for any new code. Any brand new files that are added by us will not get any copyright attribution except ours (eg. electrum-words.h and .cpp that have been added by us). For public domain code we have left the license as is (much of the crypto hashing code, for instance). If you spot ANY code where the original author has not been credited or copyright has not been retained, please let us know by opening an issue on Github or messaging or emailing us. 3. Along with this change is a new README, that should be a little better at giving the correct build instructions, as well as explaining the development rationale and a more formal staging -> tagged release methodology we will be using moving forward. 4. Since git (and, by extension, github) can be confusing to developers that are working on Monero code (or on any git repositories, really), one of the Monero key contributors, tewinget, will be hosting a Git Crash Course next week Wednesday, July 30th. He will be joined by fluffypony, and all interested are invited to attend. It will be broadcast through Twitch, and questions and discussions will happen in #monero-dev on Freenode during the course. It's going to be relaxed and informal, so if you want to know how to use git properly it's well worth tuning in. It will start at 2pm EST (6pm UCT). Feel free to invite anyone that you think will benefit from it! RPC: a new RPC call has been added to the daemon, get_info. This returns information on the current state of the daemon and the network, including the current block height. RPC: the new get_bulk_payments RPC call is complete and available. Apart from being able to pass thousands of payment IDs to this function, you can optionally pass a block height, and it will scan from the block height up. To give you an indication: Poloniex went from taking nearly 45 minutes to scan all of their payment IDs with get_payments, to it taking around 17 seconds with get_bulk_payments. Hello, and welcome to our ninth Monero Missive! Sincerest apologies for the late posting of this one, there were some interesting statistics we were finalising that you will find below. 1. We had a lot of fun giving a Git Crash Course last week Wednesday, and it was well received by all despite some technical issues with the sound. To that end, we've decided to launch a regular "Monero Fireside Chat" session as a way of both introducing the occasional new feature even before its announcement in the Monero Missives, and as an ongoing developer technical resource. We aren't sure of the frequency we'll do these, so we'll announce them as they're planned. Our first one will be this Friday, August 8th, 2014, at 9:00 EST (note: EST, not EDT) which is 14:00 UTC and 16:00 UTC +2 (aka FOST - fluffypony and othe standard time). This week Friday we will have a very special announcement, before going in to a technical discussion, so if you are able to join us live for that then please do so. It will be broadcast live via Google Hangouts on Air, so you'll be able to watch it on YouTube, and during the dev discussion portion following the announcement we'll be available to take questions on IRC in #monero-dev on Freenode. 2. We've only recently started tracking our download stats (since July 15th), and we thought we'd share with you some download stats for Monero over the past 3 weeks. Our most popular download has been our blockchain bootstrap, which has seen 41 425 completed downloads in 3 weeks, around 74tb of traffic usage! Leading the pack on these downloads is Windows with around 78.2%, followed by OS X with 14.5%, and the remaining 7.3% snagged by Linux. The client downloads are quite interesting, too - of a total of 15 000 downloads in 3 weeks, Windows again grabbed 78.4%, OS X only grabbing 9%, and Linux grabbing a surprising 12.6%! This obviously excludes those that clone the github repo and compile, which is the majority of Linux users and OS X users (thanks to sammy007's Homebrew recipe). We'd like to thank the donations we've received thus far - it goes directly to many things, including covering costs like the bandwidth provision to help bootstrap new users. 3. As mentioned in our last Monero Missive, Poloniex added a number of XMR market pairs. In the 12 days since, those markets have had a combined volume of 5830 XMR, and it is growing on a daily basis. The additional liquidity for both miners and traders is certainly a boon to cementing Monero's market position. 4. We're happy to announce that Monero has been added to the CoinsSource Trust Index, with a rating of 6 out of a possible 7 stars. 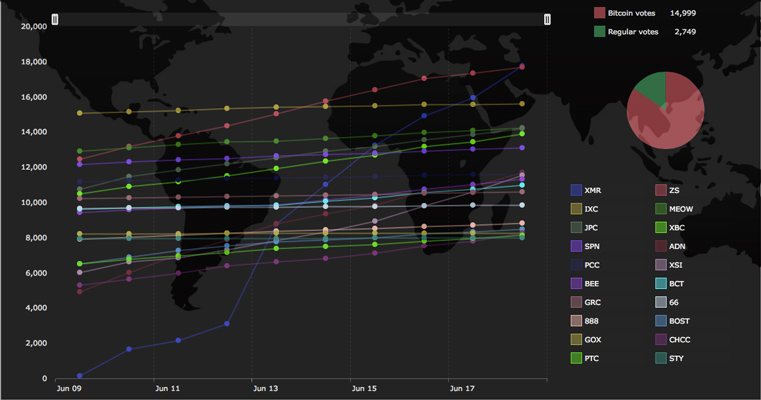 More information on the Trust Index can be found on the CoinsSource Trust Index page. 5. Most of the dev effort recently has been around a smoother and cleaner build process, which is important as we move towards continuous integration (through Jenkins) as well as deterministic builds (through Gitian). This will mean that binaries of the code that is currently undergoing testing will be readily available, and it also means that we will have a secure build process so that the binaries you download from the Monero website will be verified and verifiable. Over and above that, the QoS bandwidth management system is functionally complete, and will go into the main staging branch for testing within the next few days. Finally, the backend for DNS seed nodes has been completed, the source code has been published, and the Monero seed nodes are up and running. Integration of DNS seeds into the network seed procedure still has to be completed, but when complete this will ensure a safer and vastly more secure method of discovering the Monero network and connecting to it. Core: jakoblind has closed a number of github issues. The first major one is adding an optional blockheight parameter to a wallet refresh (ie. refresh from that point). Core: the second issue closed by jakoblind is the addition of a set of RPC and CLI calls to retrieve the mnemonic seed or the view key for an open wallet. The new RPC call is query_key (a generalised call that lets you specify 'mnemonic' or 'view_key' as the key type). The CLI command is 'seed' to retrieve the mnemonic seed, and 'viewkey' to retrieve the view key. Wallets that are not deterministic (ie. very old wallets, or wallets that are specifically created as non-deterministic) will error out when trying to retrieve the mnemonic.